This multi-media instructor-centered CBT MCSE Exam 70-298 training program teaches students the skills and knowledge needed to design and setup secure networks. The following topics are covered: organizing design teams, evaluating security threats, and modeling threats to ensure networks are protected from outside threats. Students can improve their ability to make tough decisions by using an interactive feature simulating real-world situations that is available in this course. When using this feature, students will be responsible for collecting and sorting through data to solve the security problem being presented. Clay is certified as a Microsoft trainer. 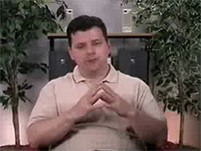 He has taught courses nationwide, and his expert instruction is present in these CBTs and videos. Clay currently serves as Nexus Worldwide Computer Trainings' Chief Instructor for the MCSA and Windows 2000/2003 bootcamps. Additionally, he assists with development of the Windows 2000/2003 boot camp lab manuals and course content. Clay also served as Global Knowledge Network's lead instructor. For the excellent instruction he has provided at these bootcamps, Clay has been awarded 12 awards. 1.1 What is ISA Server?